FREE CARRY BAG. The Bushcraft Grill set provides easy campfire cooking with its sturdy stainless steel mesh and compact size. The Bushcraft Grill is custom built with thick edge-to-edge welding which creates a strong cooking space, unlike other grills that sag due to size and construction. This eco-friendly grill is ultralight and flat which makes it perfect for fitting into any backpack. The Bushcraft Grill is reusable and easy to clean. Grill Care: Even stainless will rust if not cared for properly. Wash and fully dry your grill before storage. Use the included stainless steel split rings to connect your three bushcraft grills to create a family sized grilling surface. Connect the three grills with the included stainless steel split rings to make a family sized cooking surface. Rings not installed. Full 304 stainless steel edge-to-edge welding across the entire mesh grill. Hand made in the USA with domestic and imported materials. Nylon bag is imported. Each grill measures 125mm X 245mm. Assembled three wide with the included rings makes a 9 3/4 inch by 12 inch cooking surface. 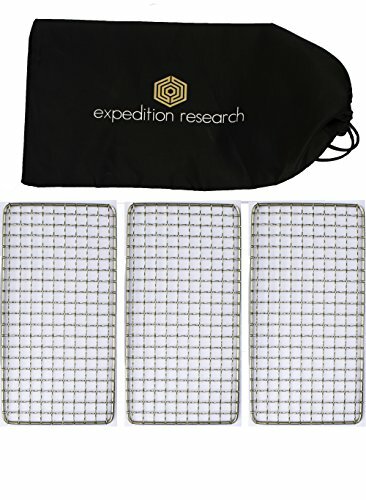 If you have any questions about this product by Expedition Research LLC, contact us by completing and submitting the form below. If you are looking for a specif part number, please include it with your message.